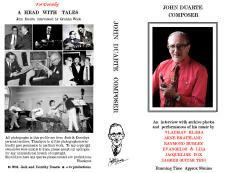 On behalf of e-tv productions, Music on Earth are pleased to be able to offer this very limited edition VHS celebrating the life of this remarkable musician / composer John W. Duarte. (PLEASE NOTE AVAILABLE IN PAL format only - sorry no American NTSC version available). In 2001 Dorothy Duarte and guitarist Brendan McCormack approached e-tv productions and asked if it would be possible to give John ('Jack' to his friends) the opportunity to tell his story to camera. Paul Balmer was delighted to offer his services as cameraman and director and Judy Caine dealt with the myriad of details. The author Graham Wade interviewed Jack about his life and music - interspersed with his own unique brand of humour, wit and British eccentricity. During 2002 friends and musicians gave gratis performances of Jack's music by way of tribute and all music publishers and photographers gave permission for a limited edition of just 250 copies to be produced and sold to recoup the minimal costs incurred during filming, editing and duplication. e-tv would like to thank all the contributors for helping make this production possible. Thanks also to the crew members and facility houses who also gave their time at much reduced rates. Musical contributions are from Vladislav Blaha, Arne Brattland, Raymond Burley, Evangelos & Liza, Jacqueline Fox and the Zargreb Guitar Trio. The video also contains rare photographs from John's personal archive. This is a fascinating glimpse at a little known era in the history of the guitar and it's music.